Hanumanagundi Falls, also known as Suthanabbe Falls or Soothanabbi Falls is located in the hilly surroundings of the Kudremukh National Park in the Chikkamagaluru district of Karnataka, India. Hanumanagundi Falls is located between Karkala and Lakya Dam in the Kudremukh national park. Hanumanagundi Falls has an elevation of 996 m (3,268 ft). The water falls from a height of 22 m (72 ft) and is a tiered waterfall. Hanumanagundi Falls is situated at a distance of 79 km (49 mi) from Mangalore. ^ a b "Elevation maps with Altitude - Hanuman Gundi". ^ a b "Elevation of Hanuman Gundi". ^ a b "Hanumangundi Falls now at its best as season draws to a close". The Hindu. 11 January 2012. Retrieved 7 October 2017. 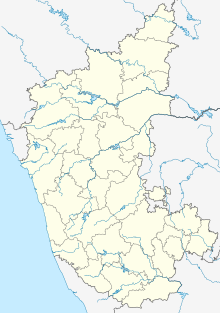 ^ "Distance between Mangalore - Hanuman Gundi Falls". Retrieved 6 October 2017. Wikimedia Commons has media related to Hanumangundi Falls.